ALBUQUERQUE, N.M. (AP) Richard McQuarley’s five rushing touchdowns tied a New Mexico school record and he finished with 179 yards to help the Lobos overcome a sluggish first half to come back for a 56-38 victory Saturday over Air Force. Four of McQuarley’s scores came in the second half, including bursts up the middle of 63 and 65 yards on consecutive possessions in the fourth quarter. New Mexico (3-2, 1-1 Mountain West), which led the country in rushing last season, had just 83 at halftime before exploding for 280 second-half rushing yards. Lobos coach Bob Davie credited the offensive line with enforcing itself upon the Air Force defensive line. It was the first time this season where New Mexico was able to have consistent success up the middle. Arion Worthman threw for three touchdowns and had 90 rushing yards and another score for Air Force (1-3, 0-2). But Lobos quarterback Lamar Jordan, who only completed four passes, had 146 yards and two scores, hitting Jay Griffin IV for a 75-yard score and Delane-Hart Johnson for a 49-yard TD. The game was delayed for an hour at the end of the first quarter because of lightning, reducing the halftime to five minutes. The national anthem was played at the end of the first half and at least four of the New Mexico players knelt. THE TAKEAWAY: The second straight win for New Mexico helps the Lobos forget about its recent two-game skid that included a disappointing 30-28 home loss to rival New Mexico State. 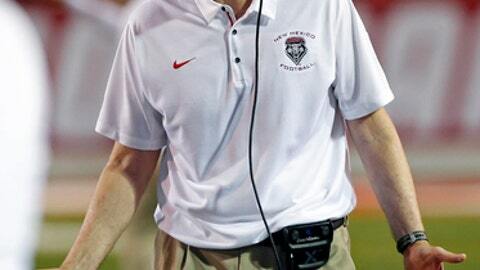 It also puts New Mexico within three wins of bowl eligibility for the third straight season. The Falcons are all alone at the bottom of the conference’s Mountain Division and have lost three straight in the series and four of the last five. KEY STAT: Air Force lost two fumbles, which were the first two the Falcons have lost this season. The Lobos turned each of the turnovers into touchdowns. UP NEXT: New Mexico has a week off before resuming Mountain West play against Fresno State on Oct. 14. Air Force is at Navy on Oct. 7 in the opener of the Commander and Chief’s trophy competition. The series also includes Army, but the Falcons have taken the trophy two of the last three seasons.